Portrait of the author. 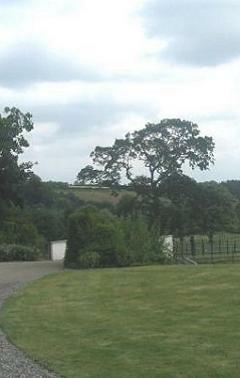 Picture by Joanna Hulme. The poster outside the exhibition. The 4-page A5 exhibition leaflet. 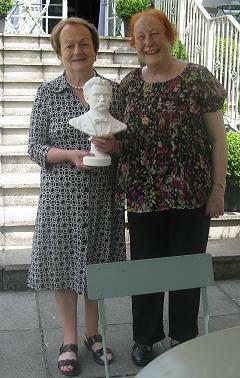 Sheila Crehan and Lis Nicolson. 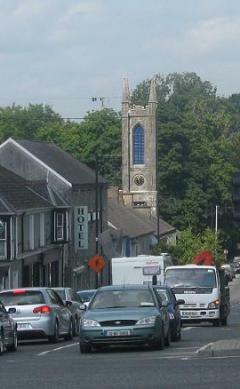 Slane Village stands at the meeting of two national routes, the Dublin to Derry (N2) and the Drogheda to Navan (N51) roads. 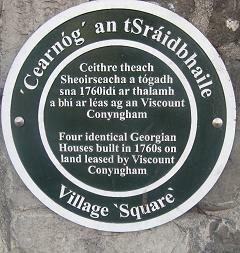 when Viscount Henry Conyngham of Slane Castle laid out a new residential square on the old market place at the crossroads, with a three-storey house set back at each corner. Today this square is dominated by its role as a traffic intersection. The church and the hotel also date from this time, as does the mill by the river. The bridge across the river also crosses the derelict Boyne Navigation canal which a volunteer group is working to restore. 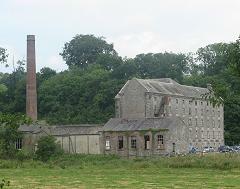 Near the bridge is Slane Mill, built in 1766, powered by water from the river. 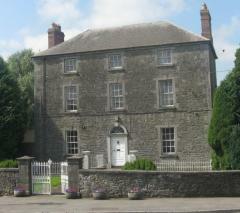 Janeville, just outside Slane, was the birthplace in 1887 of a contemporary of Cassidy from the literary world the poet Francis Ledwidge, whom Cassidy knew and is believed to have modelled a bust, possibly at the Lincoln Grove studio in 1916 when Ledwidge had been recovering in a Manchester hospital from wounds incurred as a soldier in the World War. Sadly, no trace of this work has been found except a brief mention in a newspaper; it may never have progressed beyond the clay model stage. Returning to the killing fields in December 1916, Ledwidge was killed by a shell on 31 July 1917 during the third battle of Ypres. 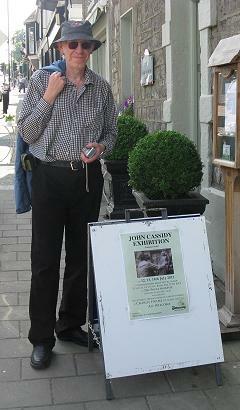 His birthplace has been a museum since 1982, but unfortunately time did not permit a visit on this occasion. 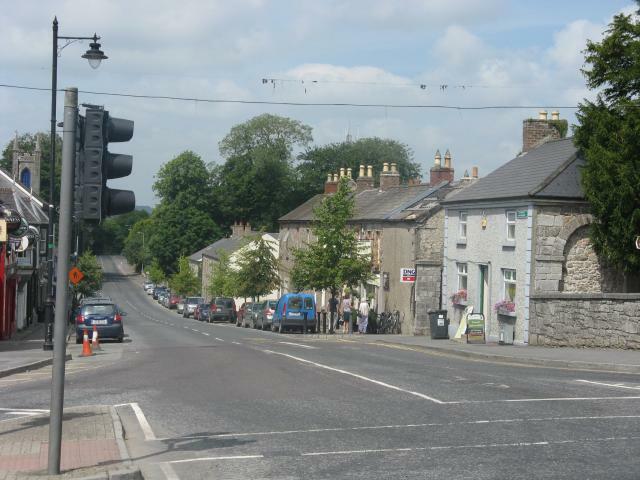 On 13 July our friends in Slane kindly provided for visitors a minibus tour of the historical sites in the area around Slane. Led by Mick Kelly led the tour and accompanied by local resident Frank Lynagh, we first visited the site of the Battle of the Boyne (above) and its visitor centre, which has very interesting audio-visual displays explaining the background and history of this famous event. 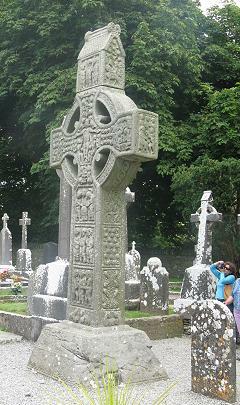 ... and High Crosses dating from the tenth century. At Old Mellifont Abbey, a Cistercian monastery founded in 1142, we joined a group of students from Spain in an extremely detailed and interesting guided tour of the site. 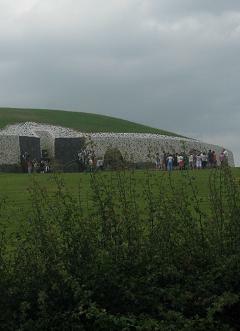 Before returning to Slane, we called at a viewpoint from which we could see one of the most famous prehistoric sites in Ireland, Newgrange stone age passage tomb. All day, buses bring groups of visitors from the Battle of the Boyne visitor centre experience the tunnel inside this structure. Not having a car, and with minimal public transport in the area, we would not have been able to see these sites without great expense, so the tour was most welcome. 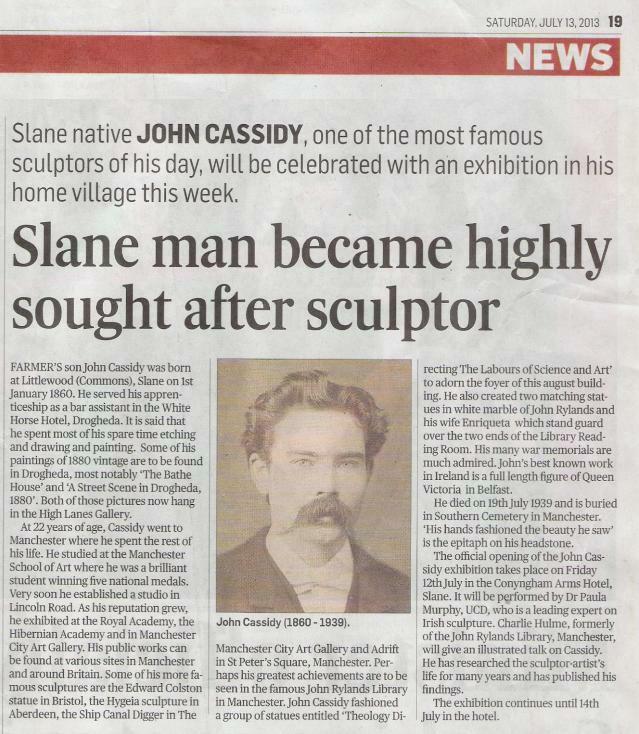 When I was invited to give my talk on John Cassidy at the opening event of the John Cassidy Exhibition to be held in his native village of Slane, County Meath in July 2013, I didn't take much persuading, as I had never previously visited the place. My wife Joanna and I travelled by the Holyhead - Dublin ferry, train from Dublin Connolly to Drogheda, and the no. 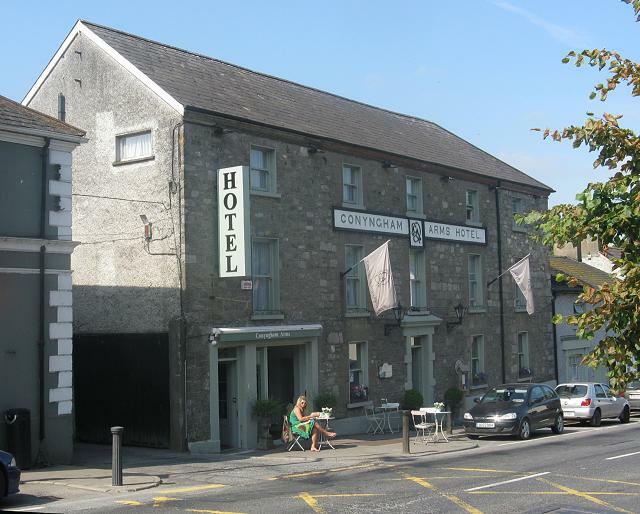 188 bus to Slane, where Shelia Crehan, secretary of the Slane History and Archaeology Society, kindly met us and showed us to our comfortable accommodation in The Old Post Office Bistro / B & B. ... and a very well-written feature in the newspaper. Who would have thought I'd ever get my name in the Meath Chronicle? 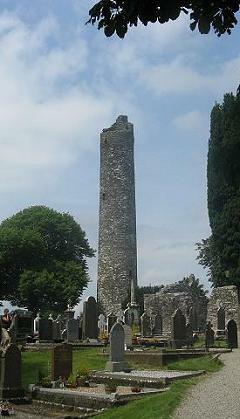 The event was part of 'The Gathering', a national occasion in which people of Irish ancestry are encouraged to visit their ancestral home. 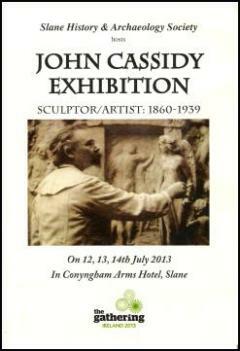 The exhibition took place in the Conyngham Arms Hotel in the centre of Slane, a coaching inn dating back to the eighteenth century, where I was to take part in the opening event starting at 8pm on 12 July. 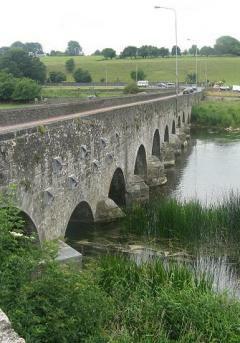 It is said that Cassidy would partake of a drink here with his friends when he returned to Slane to visit his family. The weather on 12 July was very warm, and nobody know many people would come to the event in the hot hotel room when they could be enjoying the weather in their gardens; in the end, a large audience of a hundred or so filled the space, making me feel rather daunted. The room did not get any cooler, either. The evening was chaired for the Society by Ita Mahon, who Chairman of the History Society and a member of its John Cassidy Sub-committee. After a welcome to all by Father Joseph Deegan, the Parish Priest of Slane, Dr Paula Murphy, Senior Lecturer, School of Art History & Cultural Policy, University College, Dublin, gave us a very interesting talk about the background Irish Sculpture, placing Cassidy's life and times in context and singling out some particularly interesting Cassidy works. 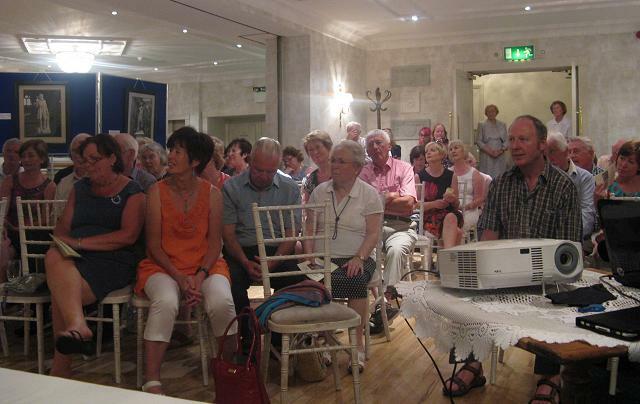 It was then my turn, and I presented my digital slide show about Cassidy's career in Manchester, which people seemed to appreciate, despite some glitches with the microphone and my unfamiliarity with the laptop which had been kindly lent by Mr Tom French, of Navan local studies library, who was in attendance for the event. Thanks are due to everyone who turned up to listen in the heat of the night, and took the time to make kind comments about the talk. 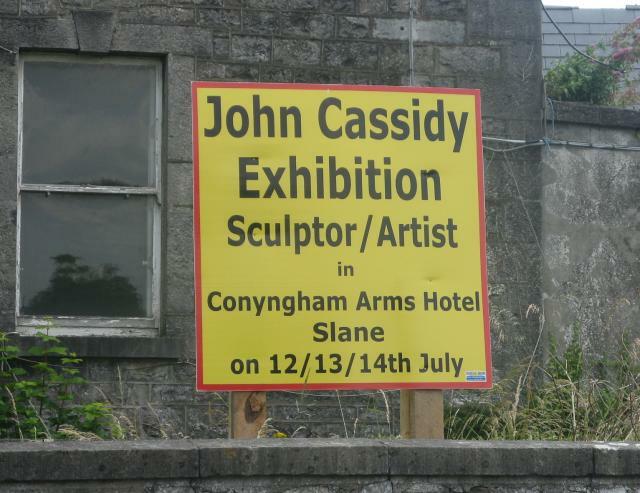 The exhibition itself included all the photographs of Cassidy works which had graced the previous Cassidy exhibition in Slane in 2004, as well as a selection of actual works and other memorabilia. 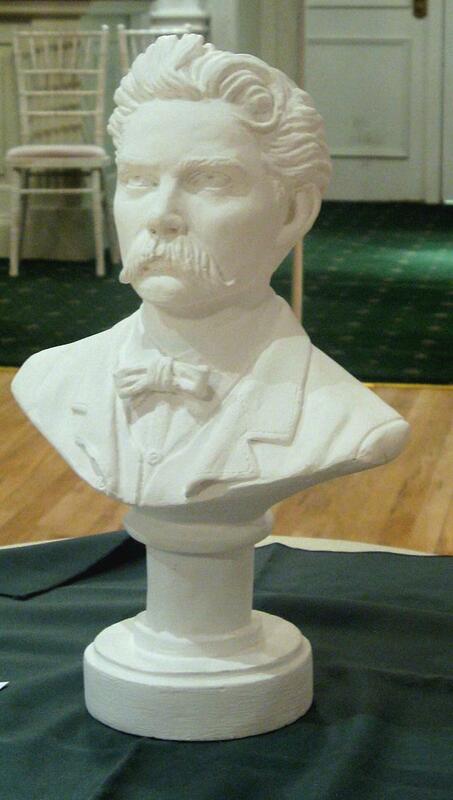 Star of the show was Cassidy himself, in the form of an excellent new bust by local sculptor Jim Flynn. 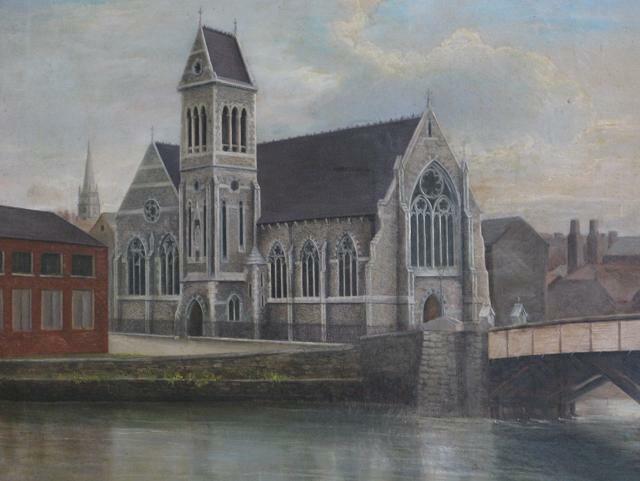 Paintings by Cassidy from his Drogheda days were on view, including 'Dominican Church in Drogheda' (above) which shows coniderable technical ability. 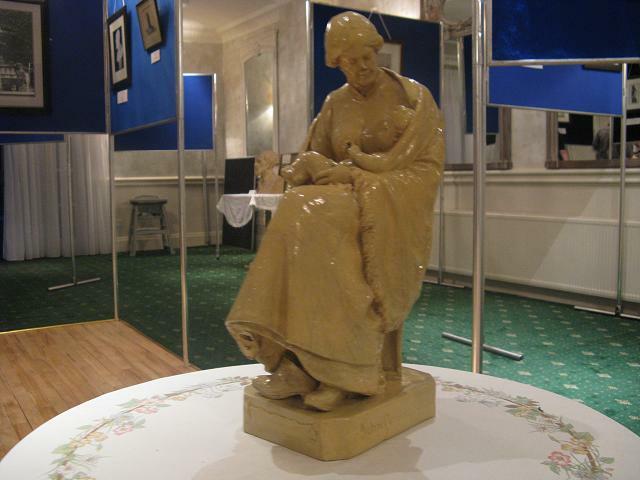 Also present, along with its owner Lis Nicolson, was 'The Weaver's Wife'. Lis, and this family heirloom, has been a major inspiration to the creation of this website. Lis travelled from her home in Shetland to be present; it's always good to meet her in person. 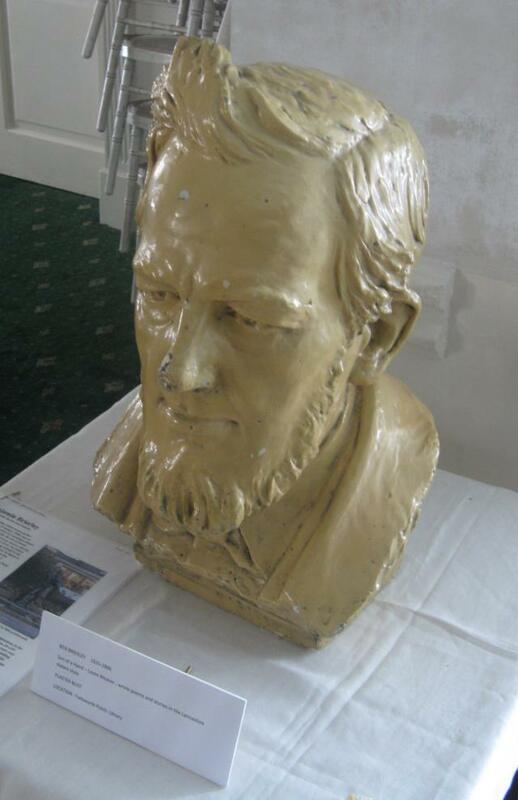 One object I was not expecting to see was the plaster head of Lancashire dialect writer Ben Brierley which I last saw in 2008 when I visited Failsworth Library, north of Manchester, to research our feature 'In search of Ben Brierley'. It was brought to Ireland for the exhibition by Patrick Duff, an engineer who was born near Slane and now lives in Failsworth. It turns out that the library building I visited, which itself was a relatively modern replacement for Failsworth's Carnegie Library, has been demolished, and a library opened in the nearby Town Hall in Oldham Road which had been disused for some years before being refurbished and re-opened for community use in 2011. 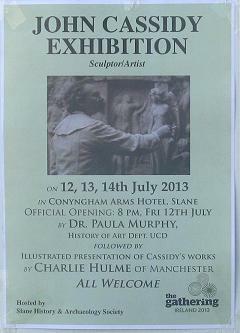 Observing that the head (which was made by Cassidy in preparation for the full-size statue which no longer exists) was not on display, Mr Duff tracked it down to where it had been stored by Oldham Council (whose area includes Failsworth) and obtained permission to bring it over to Slane for the exhibition. 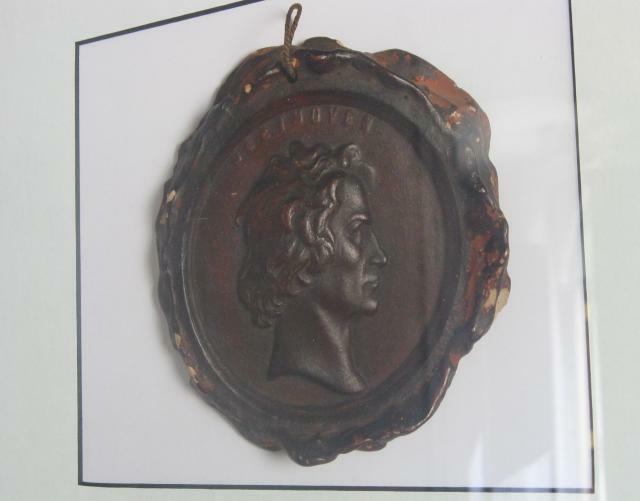 Amongst the other exhibits were two paintings I had not seen before were a collection of photographs of the Cassidy items kept in storage by Manchester Art Gallery, including a plaster medallion of Beethoven (above), which was not among the items shown to Lis Nicolson and myself when we visited the Gallery store. John Donohue from Athlone brought his Alcock and Brown memorial medal. It was great to see again my friends from the Slane History & Archaeology Society, and make new friends who admire the work of John Cassidy. The John Cassidy Sub-Committee members, Phyllis Leahy, Sheila Crehan, Marie Meade, Frances Lee Gargan, Noel Foley and Ita Mahon, have done marvelllous work raising awareness of Cassidy's work, including the funding of refurbishment of his gravestone. Michael Leahy, a founder member of the Sub-committee, sadly died in 2011. Joanna and I would like to thank the Society for inviting us to their event and for their friendship and hospitality. Thanks are also due to everyone else who helped make the weekend a success, especially the staff of the Conyngham Arms Hotel. Written by Charlie Hulme July 2013.